Madeline Ashby’s 2016 Company Town is a standalone science fiction novel that has received enough acclaim—in large part due to its position in Canada Reads—that I have as yet been unable to obtain a copy . That is why this is a review of her 2013 novel, iD. 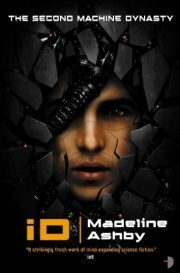 iD is the second instalment in Madeline Ashby’s Machine Dynasty series. Every von Neumann robot that has ever been built comes with an infallible fail-safe that will kill the robot deader than the dodo if the robot fails to protect and serve their humans. Every robot save Amy, that is. Amy’s failsafe does not work. What’s worse from the human point of view is that vN robots spawn copies unless actively prevented; all of Amy’s iterations will have similarly defective failsafes. There is an easy solution: simply kill Amy. Or rather, use her lover Javier’s failsafe to compel him to do it for the humans. This simple plan has only one flaw. I missed Madeline Ashby’s 2012 debut novel, vN, when it was first released. Back then, other people picked what I read and I didn’t have enough slack in my schedule to fit in books just because I wanted to read them. Now I that I have the luxury of time again, I intend to use it. Amy Peterson is a perfect little girl, even better than the organic variety. 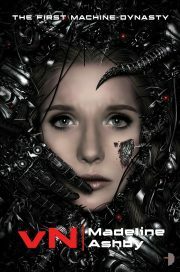 Raised by her doting organic father and his artificial wife, Amy’s physical parameters are constrained by diet. As for her software—von Neumann robots like Amy are programmed to comply with human demands. She will even auto-destruct if a human suffers harm in her vicinity. Well, she should. Amy has a tiny flaw in her programming.